Today we have updated the app with some improvements, most of them aimed at more efficient management of your GTD lists. Let’s see them. Now you can filter the Next Actions list by the context in which you are (tag), and your time and energy available, while you put the focus on the important or urgent tasks as well (1). The sum of all the filtered tasks’ duration estimates (2) is also shown, so you quickly get an idea of the amount of work to do. We have changed some names. The tasks marked with the star-shaped icon are no longer called important, they are the ones you need to focus on in the coming days, for whatever reason. The term high priority has been changed to urgent. The difference is that priority is something that you assign arbitrarily, but urgency is given externally. Remember that there are no priorities in GTD. In addition to low energy, we have added the high energy option, so you can conveniently classify tasks that require great concentration. In addition to the total number of events that your Calendar contains, you can now see at a glance how many are overdue or will end today (1). We’ve changed the order in which the events are displayed. For the same date, the events scheduled at a specific time are shown before the ones with no time assigned (2). You have a new filter to see only the events for today. The list of done actions contains a historical record of everything you do, but it was certainly unwieldy. Now you can filter the actions you did between two specific dates (or one day if you put the same start and end date). Done tasks coming from the Calendar also show the date for which they were scheduled, in addition to the date in which they were completed. Once launched, the process can take several minutes depending on the number of tasks to remove, so forget about it and continue working. In the list of tags that accompanies each list we have included a fictitious tag called _untagged. This pseudo-tag lets you know how many items in the list are not contextualized by tags, and what they are. The most-used tags tool—lets you add the most common tags to your tasks in an easy and quick way—is now more useful because it shows the tags you used the most during the last 6 months. Previously it showed the most used forever, and tags that you used a lot before and not now used to appear. Last month we completely updated the integration with Evernote. Now we have added a new parameter on the processing rules, so you can better classify your Evernote notes. 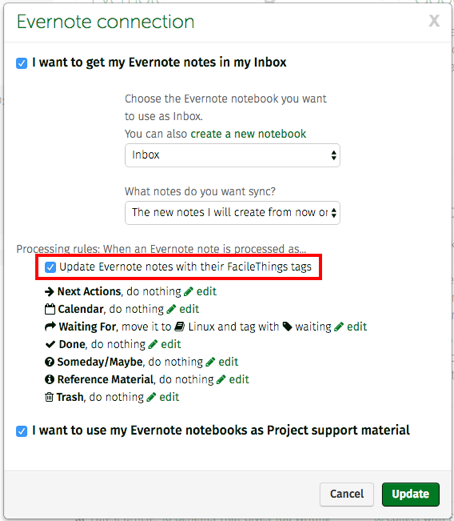 If you activate this parameter, the tags you type on a FacileThings item will be added to the note in Evernote. We have also fixed a bug: the FacileThings item wasn’t updated when the title of the note was modified, and it was still in the Inbox. Each time a new action is added to a kanban-style project (from the Lists or the Process pages), it goes to the “Doing” column, instead of the “To-do” column. Routines section: the tab in which you were working wasn’t kept, and you lost the position with any page refresh. It is fixed. The Cancel button in the Collect option didn’t work, since the stuff was created anyway. It is fixed. An error that occurred when you sent an email without content to the Inbox has been fixed as well. Thanks for the continued improvement of the app. I really appreciate these new list management features and tweaks. The ability to filter "on the fly" and drill down to the relevant action items with respect to context, time and energy will only serve to boost my productivity and implementation of GTD principles. Great improvements! There are a couple I suggested some time ago so I'm so impressed that you guys have listened and responded. What a great app, what great service! Well done! Simply outstanding. This update further strengthens a client's ability to control, adapt, and execute. I am very impressed with the continued work and ongoing effort by the FT development team. The future is bright and I am most eager to be part of FT's continued success. Thank you very much for making an application that empowers me to focus and succeed. Very timely update for me. For the past couple of months I've been struggling a bit and finally realized I was abusing the "important" flag and under-using the existing filtering capabilities. I had just started formulating a plan to fix that and, voilà, you unveil an update that does most of the work for me! Very smart move renaming "important" and "priority." And having new filters to remove the clutter from my lists (where clutter = anything I can't do right now) really helps me focus -- a short, manageable list of things I can actually do right now is an incredibly effective way to give myself permission to ignore everything else. I worked a half-day yesterday and checked as many things off my list as I have in any of my full work days this week. I know the mobile apps will probably lag behind the website for a little while, but I'm really looking forward to seeing the new filtering tools there! Wish more people this wonderful community and know about your great GTD tool! Great changes! This allows much more depth in how much we can customize the Next Actions list. For some reason however, when I click on a tag, the sum of the filtered task durations does not change to only include the durations of the tasks being filtered. It still shows me the full total (as if I had not selected a tag). Hi Ugo, thanks for noticing the bug.